We had a hard time convincing a heifer earlier this week to follow us to another field. While we were moving her I thought about another particular animal who really had her own idea about where she was going to go! See the heifer on the right? I’m naming her Ackbar after Admiral Ackbar from The Return of the Jedi Star Wars movie. She was definitely not walking into a trap like that one. We were trying to move this group of eleven heifers to another field. The heifers are sorted by age and size and this group was ready to join another. We sat up a small corral and moved a feed box into it to give them grain and a good reason to go in on their own. Once inside we could ease them into the waiting cattle trailer. Now this went well for the for the first two trips with the trailer. But Ackbar and her cohorts decided they would not go into the corral. We went back yesterday and fed them, but they were still not convinced that they should do as we asked. Today we found them lounging in the shade. No matter what sweet words I used to call them forward they refused to move out into the sun. We may not have the power of the force, but we do have time and patience. A few more days of feeding in the corral and I think we will win them over to our side. So I hired a hitman…… umm…this probably bears a good explanation. After feeding Ackbar the suspicious heifer and her associates for two weeks in the corral we had still made little progress in getting them calmed down enough that we could load and move them. Then she left. I mean on her own. Ackbar jumped the fence and got in with the neighbor’s cattle. Okay, what sounded bad ended up being a little better when we found out he had a corral, too. 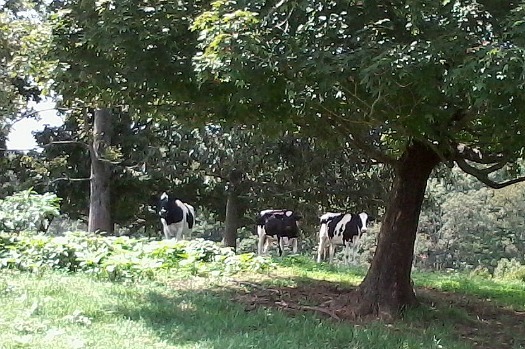 The new plan was to wait for Ackbar to get used to the new cows and go in to eat with them in their corral. A week and a half later our neighbor called to say that Ackbar refused to go in his corral and was jumping back and forth over his fences. Please come and get your cow was the main part of his message. At this point we felt we were running out of options on ever getting her home. We couldn’t catch her no matter how we tried. We needed help. For those of you who have been waiting patiently, we’re now to the hitman part. So, I know a guy that knows a guy. Isn’t that how the story is supposed to go? Actually, in this case, I know a girl that knows a guy, but you get the idea. The guy is a professional, or maybe I should say he has professionally tranquilized animals before. The new plan was for him to shoot her with a tranquilizer dart and then we could load her up and take her back home. The outcome of this plan ended up being best summarized by a refrigerator magnet I saw once: Man plans, God laughs. Ackbar, who seemed to have some sort of Spidey-sense to keep her away from danger, always managed to stay just out of range of the tranquilizer gun. She eventually jumped the fence and wandered around our neighbor’s farm from one side to the other with us following by truck or on foot. Eventually, and I do say eventually, the pendulum of luck swung mostly back to us. Ackbar walked into the corner of the fences and hopped back over into our field. No tranquilizer needed today. We moved some new calves into the field with Ackbar and her cohorts and it has definitely helped. She has calmed down enough that we were actually able to touch her (really!) while she ate without her flinching and running away. Hopefully, and I do have hope again, we’ll be able to move her next week to the field with heifers her age and size. Justice came late or Christmas came early depending on your perspective, but Ackbar has finally come home. Moving Ackbar, the suspicious heifer, to the field she needs to be in has been on our to-do list, but has kept sliding down further and further until today. Working with her has been a real chore and even outside help (in the form of a hitman!) has not helped until now. We had been feeding her and her cohorts in an open corral for weeks waiting on her to calm down. 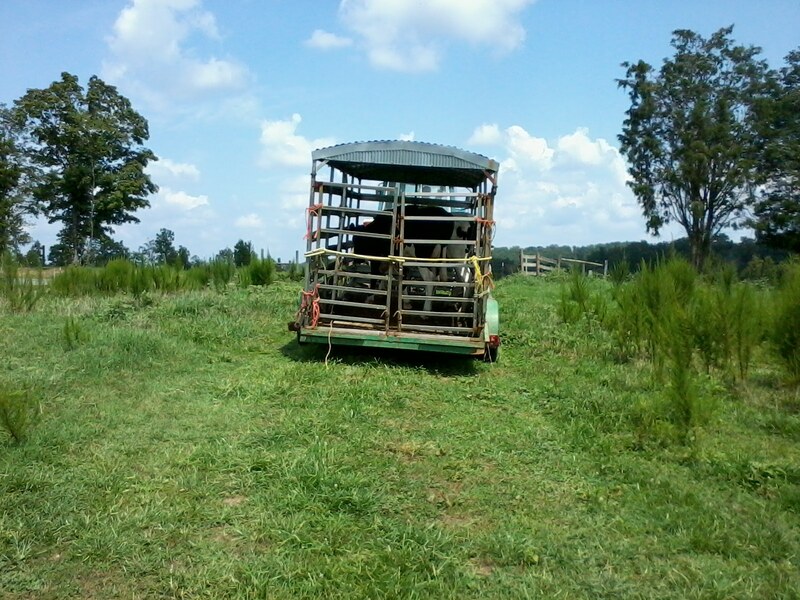 Today we locked her in the corral and loaded her onto the trailer. Ackbar and her pals are now where they belong and this story is finally over! Haha! I’ve been through this! Some heifers, right? It took a couple tries to get the one we needed this week, but nothing like this. Now that one was contrary! Sometimes you just don’t know what they’re thinking! If only we had telepathy like Professor X.